We are always working on new spirits, and occasionally come up with creations that we are excited to share. We often bottle these spirits under our Distillery Series label, and those ones are only available here at the distillery. These products are often made only once, or on a very limited basis – check back often or you might miss out! Starting fall 2018, we are serving and selling a new spirited collaboration – The Dearborn Gin, which we developed with our friends at The Dearborn Tavern in Chicago. This gin has a classic profile, with fresh juniper, bright citrus (we used fresh grapefruit, lemon and lime), and a hint of Irish heather. Of course, you can find this gin at the Dearborn, but the only other place you’ll find it is right here at the distillery. 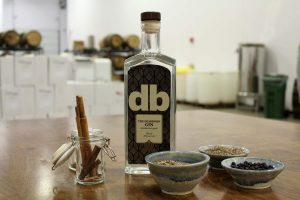 Dearborn Gin is 45% abv and is now available at the distillery. This particular whiskey has been made with a blend of our aged barrels – the youngest in the mix is 7 years old,. It has a rich, inviting nose of malt, with hints of spice, heather and eucalyptus. On the palate, it is delicious, smooth and nuanced, starting with a spice note, leading to a rush of velvety smooth malt, accents of honey and fruit, and a dry finish, with rich notes of rye spice and orange. 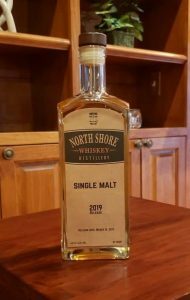 This edition is 42.5% abv, and will be released on Saturday, March 16, 2019. We’ve been making malt whiskey for many years, and we experimented with some peated malt. We really like the results – rich, smoky and peaty, this whiskey drinks kind of like an Islay Scotch with some heathery undertones. Delicious for a cold winter’s night, to be sure. This whiskey is 45% abv, and it is SOLD OUT. But there *might* be some more in the works, at Sonja’s request. A lesser known, herbal-style liqueur with caraway as a dominant flavor. We made this for fun, and enjoyed it so much we thought we’d share some of it as well. Delicious for sipping, and also for mixing – some classic old cocktails call for this obscure ingredient, and it plays well with other savory flavors. Our Kümmel was 35% abv, and is SOLD OUT. 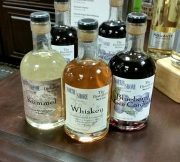 Taking inspiration from the great produce at our area farmers’ markets, we made a delicious sipping-style liqueur using fresh regional blueberries and our Distiller’s Gin No. 11. Layers of flavor, with bright, fresh fruit and rich botanicals. Delicious over ice, or with soda, but also fun to mix! Our Blueberry Gin Cordial was 40% abv, and is SOLD OUT. We have a few other tricks up our sleeve, so stay tuned to this spot for new limited edition spirits coming out soon!